Life is so much more convenient now. I know my Grandma used to have to go out in the back yard and kill a chicken to have chicken for dinner. I suppose I might be a vegetarian if I had to get that close to my food. One really handy, more-recent offering is the packs of boneless, skinless chicken breasts. OK. They've been around for a while, but I'm mentally walking back in time with Grandma. But, seriously it's really nice to grab meat at the grocery or out of the freezer ready to cook right up. I've found that some friends have problems with these chicken pieces on the grill. 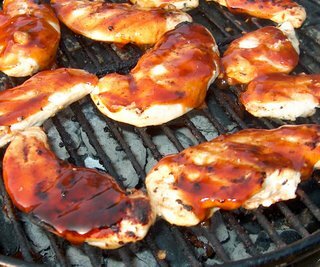 The boneless breasts usually don't have the skin and fat which does mean they take a little thought. But, once you get the basics down, they are both quick and easy. They are also low in fat and much healthier than the beef that I do adore on the grill. You bet! It's also quick and easy. My kind of recipe.